A former New Yorker editor chronicles her journey to heal old wounds and find comfort in the face of loss through travel, friends and family, and home-cooked meals in this memoir “full of warm, bracing honesty…humor and paradox…and sprinkled liberally with the type of recipes that will make book club members say, ‘I could make that!’” (Booklist, starred review). One life-changing night, reeling from her beloved brother’s sudden death, a devastating breakup with her handsome engineer fiancé, and eviction from the apartment they shared, Emily Nunn had lost all sense of family, home, and financial security. After a few glasses of wine, heartbroken and unmoored, Emily—an avid cook and professional food writer—poured her heart out on Facebook. The next morning she woke up with an awful hangover and a feeling she’d made a terrible mistake—only to discover she had more friends than she knew, many of whom invited her to come visit and cook with them while she put her life back together. Thus began the Comfort Food Tour. Searching for a way forward, Emily travels the country, cooking and staying with relatives and friends. Her wonderfully idiosyncratic family comes to life in these pages, all part of the rich Southern story in which past and present are indistinguishable, food is a source of connection and identity, and a good story is often preferred to a not-so-pleasant truth. But truth, pleasant or not, is what Emily Nunn craves, and with it comes an acceptance of the losses she has endured, and a sense of hope for the future. In the salty snap of a single Virginia ham biscuit, in the sour tang of Great-Grandmother’s Mean Lemon Cake, Nunn experiences the healing power of comfort food—and offers up dozens of recipes for the wonderful meals that saved her life. 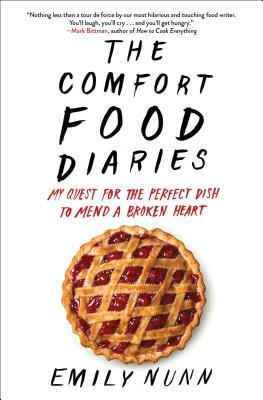 “The Comfort Food Diaries is nothing less than a tour de force by Emily Nunn, our most hilarious and touching food writer. You’ll laugh, you’ll cry...and you’ll get hungry” (Mark Bittman, author of How to Cook Everything). Emily Nunn is a freelance food writer and home-cooking evangelist living in North Carolina. She worked for almost a decade at The New Yorker, where she was an arts editor covering both theater and restaurants (she created Tables for Two, the magazine’s restaurant column) and as an award winning features reporter at the Chicago Tribune. Her writing about the arts has been featured in Vogue, Men’s Vogue, Elle, Details, Departures; her food writing has been featured in Food and Wine, Men’s Vogue, and the Chicago Tribune Magazine, among other publications. She is the author of The Comfort Food Diaries. "The Comfort Food Diaries is nothing less than a tour de force by Emily Nunn, our most hilarious and touching food writer. You'll laugh, you'll cry ... and you'll get hungry." "Come for the poignant personal reflections, stay for the recipes for country ham biscuits and grandma’s lemon cake." "Honest, brave, funny, and greedy...By the end you want to hug Nunn--and cook her dinner. A tribute to the redemptive power of food." "An exploration of the power of comfort foods...[a] beautifully written narrative, rich in details, and filled with humor and poignancy." "Gorgeous and moving...With powerful prose and rich details, [Nunn's] memoir is simultaneously uplifting and heartbreaking." "Emily Nunn's The Comfort Food Diaries is a beautiful story of hunger, nurturing, and recovery. Written with candor and an often hilarious Southern Gothic edge, it is everything great food memoir should be: delicious, delightful, heart-rending, soul-filling, and ultimately, healing."